Subterranean Press is now shipping its long-awaited limited edition of A DANCE WITH DRAGONS, a two-volume set in slipcase, gorgeously and lavishly illustrated by Marc Fishman, and limited to 448 numbered and 52 lettered copies, all of them signed by both the artist and myself. All the copies of this one have long ago been reserved... but inevitably, with these special editions, there are a few drop-outs who have "rights" to the book, by virtue of their purchase of the previous volume in the series, but fail to follow through. Which means that some number of copies will be made available to new purchasers. How many? That's hard to say. SubPress does not keep a waiting list, no... but check the website frequently and look for an announcement... and do not hesitate when you see it. Maybe you can snag a copy. 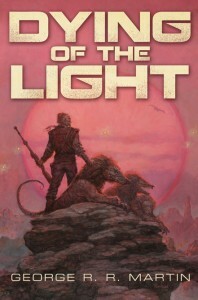 And speaking of Subterranean... they do still have copies available of a couple of my other titles, including their trade hardcover of my first novel, DYING OF THE LIGHT, with great artwork by Tom Kidd. And serious collectors might want to check out their listings for HUNTER'S RUN and STARLADY / FAST-FRIEND as well, before the remaining stocks are gone. I'll most likely get A Dream of Spring in this format to mark the end of your landmark series. ..have an email alert service too. I ordered your charts ages ago but they don't arrive 'til 18 Nov(Scotland - beyond the Wall). Attending a wedding this weekend - in a castle. Will keep wary eye on minstrels. Impatient wildling. I doubt there will be any more copies available, those which weren't claimed by previous owners in the series were put up for sale in September of 2011. There will likely be a few copies available. There almost always is. I just snagged one of the few available copies! Thanks for encouraging my obsessive checking of the Subterranean Press web page. This guarantees a chance at the Nasmith edition of Game of Thrones, correct? I believe so, but check with Subterranean to be sure. They make the rules. That is some beautiful artwork. on one hand Its a bummer that most of them are claimed, on the other Im glad cause I would be too tempted to spend money I don't have, LOL. I can't afford to buy more then one copy. I am in love with your Song of Ice and Fire books and i have read all five 3 times working on my fourth now while waiting with baited breath for 'The Winds of Winter'. you are a phenomenal writer, and i love the world you have created, it provides a great intellectual escape from the monotony of life. thank you for this literary greatness. Any thoughts on the destructive hurricane? New Jersey was badly beaten and bloodied. I know New Mexico is your home but, you will always be a boy from Bayonne. 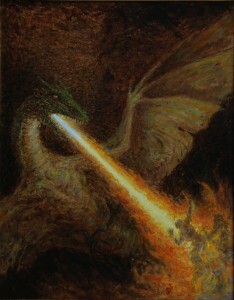 The Rhaegal and Quentyn illustration is amazing. Will try to get one!! Ser Martin...have you seen this video from 1920? It's in the Museum of Metropolitan Art Collection and was .."created by D. W. Griffith and John Barrymore to create an educational film about the Arms and Armor collection. "A Visit to the Armor Galleries includes memorable scenes," notes curator Stuart W. Pyhrr, "a Gothic armor steps out of its vitrine to answer visitors' questions about the collection, a seesaw with a small child on one end and a medieval mail shirt on the other demonstrates the relatively modest weight of armor, and a fully armored knight on horseback gallops through Central Park..."
I just purchased some of the art work prints directly from Marc. Very excited to see this version of the novel. I have obsessed over this book for going on a year...I obsessedly checked Subpress's website everyday to place my order and alas for a period of a few hours on that lucky day, I was able to purchase. 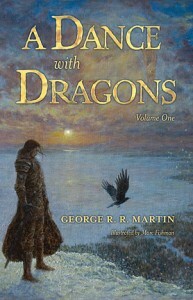 A year after that date, and the two volumes are in hand...It will be an awesome way to read ADWD. Love the saga GRRM!